The Zulu play system incorporates one of LEDON’s popular tube slides. This is accessed via the vertical climbing wall panel or the swinging suspension bridge. From here, you slide at high speed down the tube, which leaves you reeling with excitement. Crawling around the system stimulates the children’s sense of balance, coordination and motor skills, but all the cross-movements with arms and legs also strengthen coordination between the two sides of the brain, which also happens when children are learning to read and doing mathematics. Even though Zulu has many activities for older children, the system also has a play area for children who are not ready to use the swinging suspension bridges or vertical climbing wall panels. 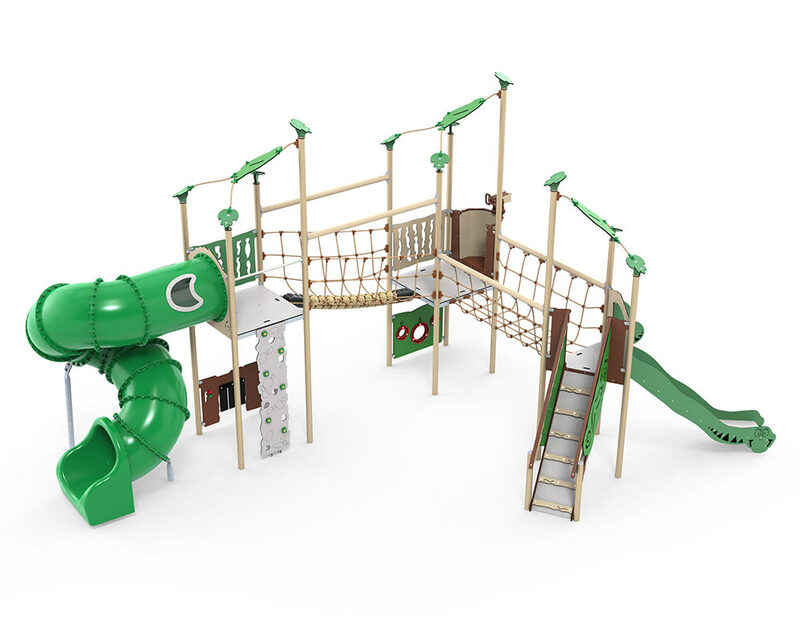 The non-slip ramp provides access to the slide which starts at a height of 90 cm, and the play system also has a number panel and a cave panel with rubber slats at ground level.